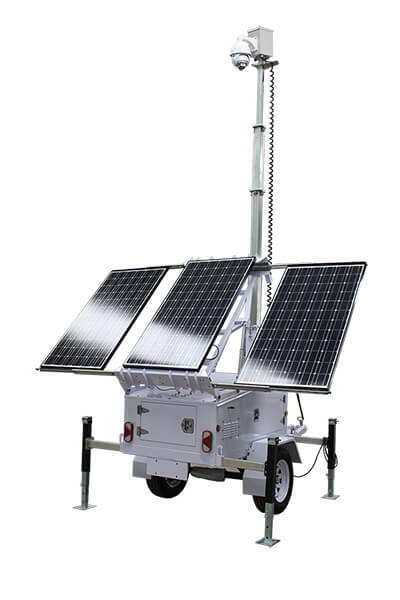 The APS Security WECU Surveillance Trailer is equipped with three solar panels, these panels slide out and have a tilt adjustment to ensure the best positioning for the sun. The telescoping mast tower elevates the high definition cameras up to 29 feet, giving you wide area coverage. 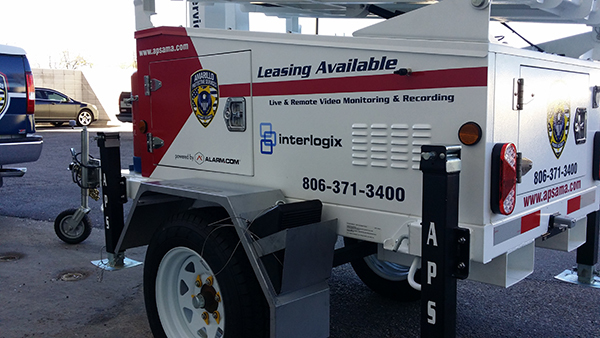 This surveillance trailer is portable and easily towed behind a vehicle, then deployed at a remote location. Monitor and control the system from anywhere in the world via the internet. Perfect for public events around town providing security and safety surveillance it’s also great in urban areas, Construction sites, the oil & gas fields, farm shops, fuel supply, heavy-equipment and material theft is widespread and expensive for both the owners of the property and their insurers. Construction site related theft has increased 10% every year since 1996 and shows no sign of slowing. Because of this, insurance companies are increasingly beginning to deny claims made regarding construction site property. You can monitor worker efficiency and productivity, as well as prevent accidents or mishaps by ensuring all staff are abiding by all health and safety regulations. Where managers had to frequently visit sites and projects first hand to determine productivity, they can now monitor multiple sites from the comfort of their office using the included remote access software. This is why setting up site security cameras with APS Security is more important than ever. It is now time to safeguard and protect your investment in a proactive manner by deploying the APS Security WECU Remote Surveillance Trailer for your project or talk to us about fixed cameras with the same great tools and features. The systems can pay for themselves in a very short time.